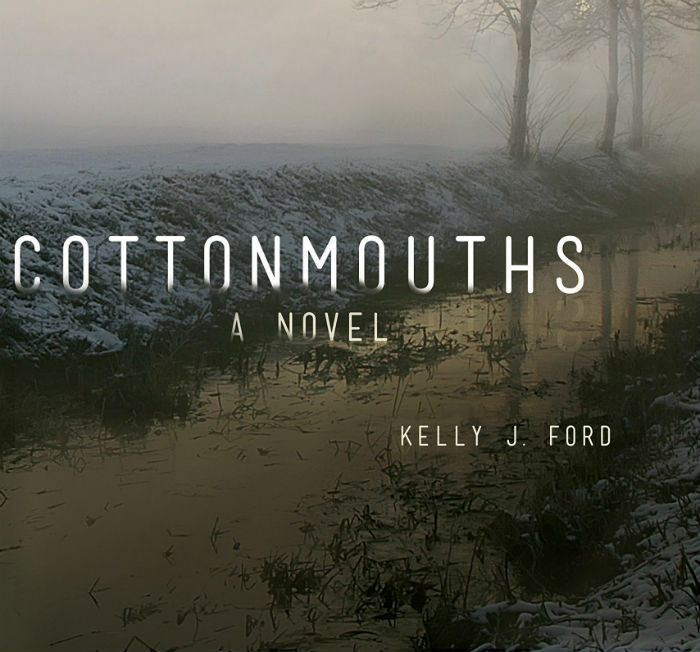 Cottonmouths, venomous water snakes found in the Ozarks, are an apt symbol for Kelly J. Ford’s debut novel about home, longing, desperation, and betrayal. Set in rural Arkansas, Cottonmouths explores the treacherous places where unrequited love can lead, and the consequences of complicity. The novel follows Emily Skinner, who has just dropped out of college and is now living with her parents in her home town, Drear’s Bluff. While dealing with the humiliation of her failed attempt to escape the place she grew up, she reconnects with Jody Monroe, the (straight) girl she loved in high school. Jody, too, has moved back to Drear’s Bluff, a baby in tow. Though this setup could easily be the premise for a heartwarming tale of love and family—the happy ending Emily clearly hopes to create for herself and Jody—Ford takes their story down a darker path. Attempting to rekindle their old friendship, Emily accidentally stumbles across a meth lab on Jody’s property. Jody, desperate to keep the lab a secret, offers Emily a job as a live-in nanny when her parents kick her out of their house. With each day, Emily becomes more ensnared in Jody’s web of lies, and more complicit in the deadly consequences of her actions. Refreshingly, Cottonmouths refuses to romanticize unrequited love. Emily is deeply conflicted about her sexuality, and though she isn’t out, she feels the pressure of suspicion and disapproval from the conservative population of Drear’s Bluff, including from her own parents. She wants her relationship with Jody to be a safe harbor, but Jody’s criminal activities, as well as her deep secrecy about many parts of her life, keep her from realizing that dream. Her behavior towards Jody is also troubling: Emily is immediately possessive, sometimes to the point of being aggressive towards Jody’s other friends, and she doesn’t acknowledge when her own behavior crosses Jody’s stated boundaries. Folks liked to slap their knees and joke that there were only two classes of people in Drear’s Bluff: poor and dirt-poor. The poor weren’t really poor. They just liked to say they were. The dirt-poor were still dirt-poor but they liked to think they weren’t. Emily and her family belong to the not-really-poor; Jody belongs the dirt-poor and aspires towards upward mobility. Part of Emily’s incomprehension of Jody’s choices is about her inability to comprehend the deep class divides between them. In a rare moment of frankness, Jody tells Emily about the humiliations of being an unwed mother in a small town, unable to find a job and experiencing derision when she needed government assistance to survive. Though Emily’s mother had taken Jody in for a few months while the girls were in high school, Jody experienced her charity as condescension rather than acceptance. Jody’s friends and accomplices paint a similar portrait of desperation. There’s Troy, a former football star whose dreams of getting out were destroyed by an injury, which leaves him with a dependency on pain medications and without prospects. And there’s August, who uses the proceeds from the meth lab to pay his elderly father’s medical bills and keep their farm from going under. They have little sympathy for Emily’s student loan debt or her inability to find respectable temp work. Together, show the reader a humanity and depth that Emily’s jealousy and desire for Jody prevent her from acknowledging. Cottonmouths is not a love story: it’s a tale of resentment, venomous betrayal, and the wounds hidden beneath familiar surfaces. Through a kaleidoscope of characters, Ford’s dark novel shows us the choices people make when the world denies them good options, and the consequences of complicity.